I couldn’t post this earlier. It was too painful and I would end up crying. Exactly 6 months ago, we lost our baby Vader. I was asleep in our room, our helper was in the bathroom and we both heard our front door open. I thought it was her, she thought it was me. I heard frantic barking from Luna the pomeranian and next thing I know, our helper barged into our room wrapped in a towel telling me frantically that Vader, our baby teacup poodle was gone. We ran to the building security and reported the loss and they started searching. We tried everything on the days that followed. Left his things outside so that he can find his way home. We are residents of Tivoli Garden Residences. 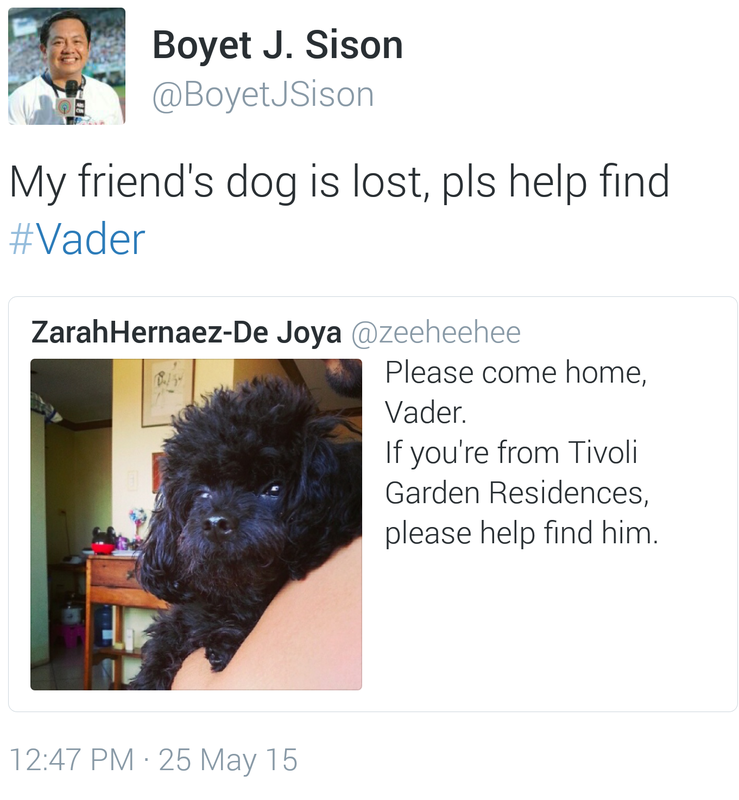 Yesterday (May 25) at around 8:30 a.m., our black poodle went out of our unit and into the hallway of the 39th floor. He was never found. I know we were remiss in having the door unlocked or even open but we are appealing to your kind heart to help us find our dog. We have placed posters at the Iris Bldg., did door to door flyering at the building and have informed the security and asked for them to view the CCTV footage of the elevator. We feel that he might have entered it and went to another floor. We were informed that we do not have CCTV at the hallways yet as we are a new building. We have done everything and ended our search at midnight last night. In fact, we have gone to social media and our call for help has been shared and reshared on Facebook. 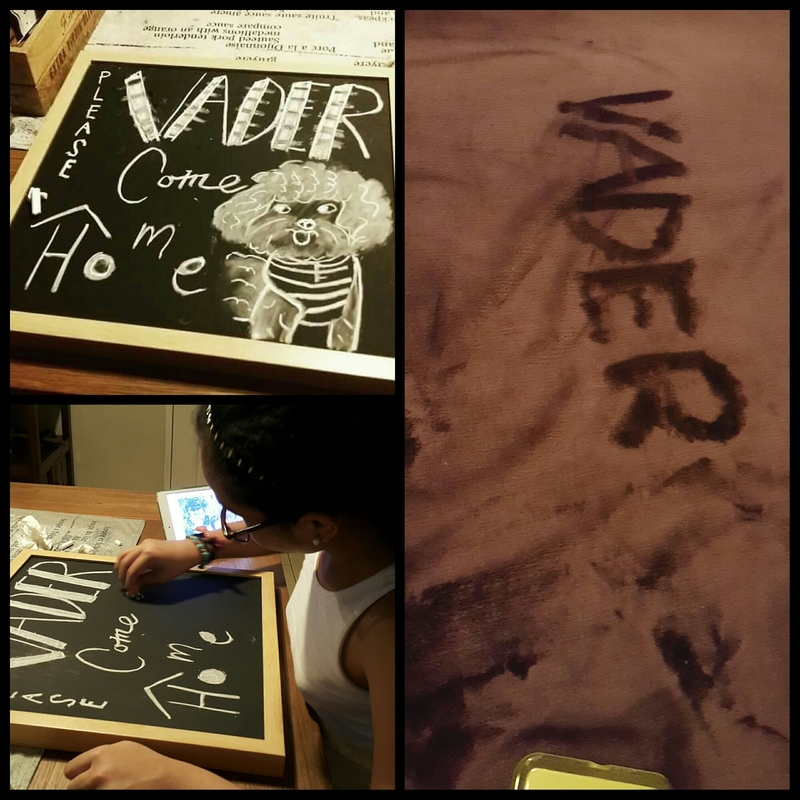 We are that desperate because Vader was family. We are all devastated. You are our only hope to ask the security to take the matter seriously as we get mixed reports or they just say “makikita rin yan” or “nanakaw na yun”. We have not lost hope and will keep hoping that he is still within the compound. I thank you in advance for even giving us the time to even read this email. I know this may be inconsequential for some but as my daughter said, Vader, our dog is family and we don’t give up on family. I was sobbing for days. Vader our baby was truly our baby. He gave my family so much joy and love. 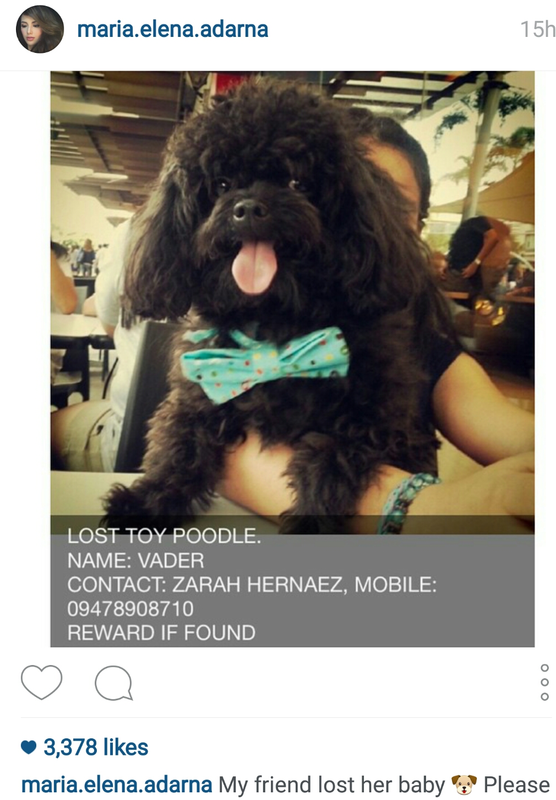 He went with us almost everywhere and weekends were spent walking him at Bonifacio High Street. He had his own Twitter account: @sithpuppy and his own Instagram account. He was family and our hearts were broken. Some people may not understand how we had so much love for a dog, a pet, but this little guy made life so much brighter for our household. He was stolen for sure. Who could have opened the door? How can a dog of 4 lbs. disappear at the top floor of a high rise condominium? They say he was stolen because we never had him neutered and some dogs get stolen for breeding. We didn’t because we didn’t want to cause him any pain. We kept searching for weeks. We even went to the pet markets – Cartimar, Tiendesitas, Arranque Market, ready to buy him back if we have to. He wasn’t there. We went through pet buy and sell sites hoping to see his picture. Friends and even celebrities posted our call for help. 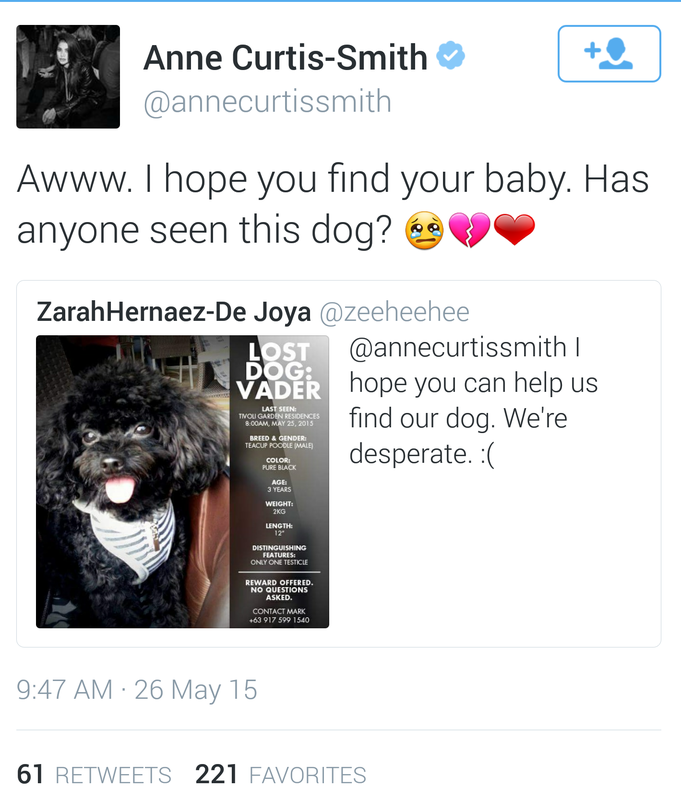 Heartfelt thanks to all those who helped us find him, Anne Curtis, Boyet Sison, Ellen Adarna and Ramon Bautista. Pet lovers all. People sent us leads but it wasn’t Vader. 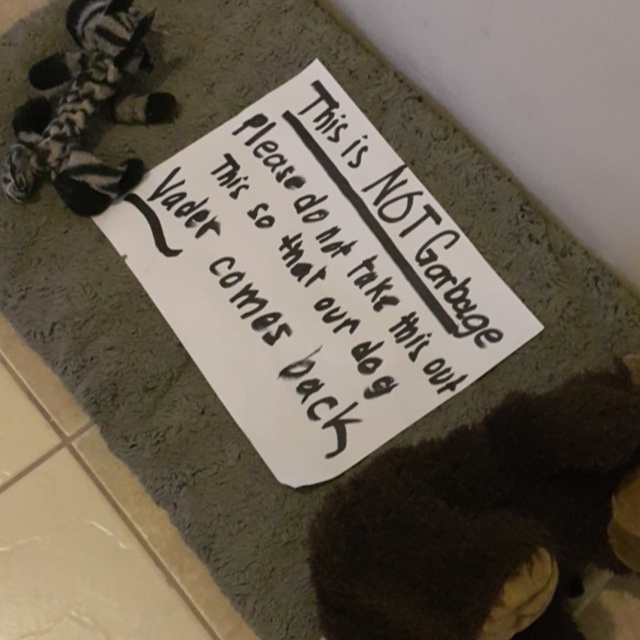 Every time someone sent us a message that they saw a lost dog or a black poodle, our hearts skipped a beat only to be crushed in disappointment and I would cry again. 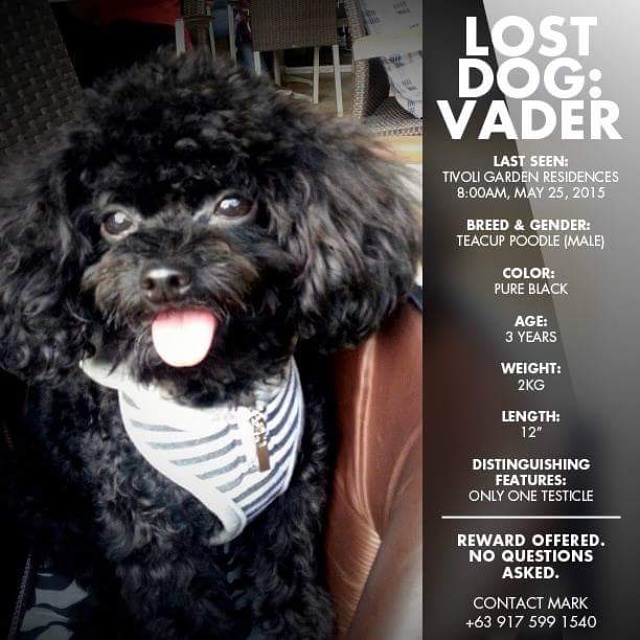 I cried and I still cry for my baby Vader, 6 months after he disappeared. The support was overwhelming. 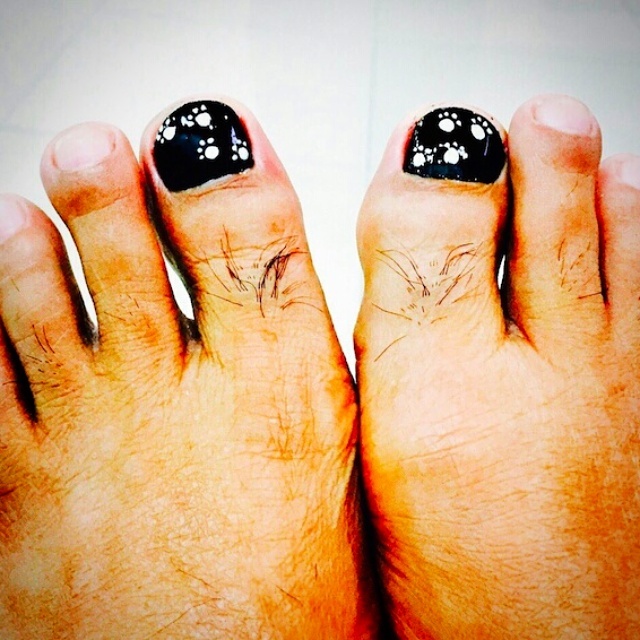 A man we didn’t know even painted his toe nails in solidarity with us and our search for Vader. This made us smile, God bless him. Black toe nails with paw prints. We will never give up but we’ve come to accept that he might be in someone else’s home now. We just pray that they love our angel as much as we loved him. I can’t even call him a pet or dog, he was truly my baby. Vader was love. A friend said one can never get over the loss. You just have to create space in your heart to love a new baby puppy.